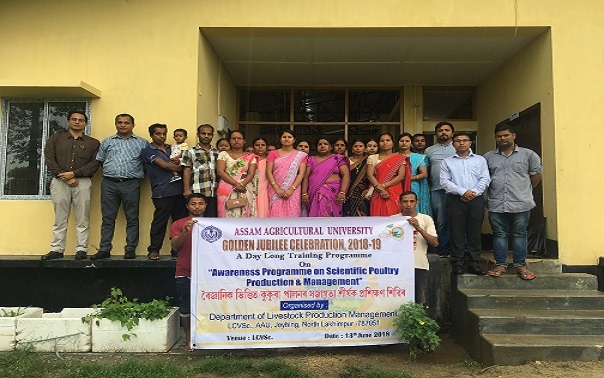 Department of Livestock Production and Management, Lakhimpur College of Veterinary Science (LCVSc), Assam Agricultural University organized a day long training programme on Scientific Poultry Production and Management on Wednesday as part of Golden Jubilee celebration of the University. Altogether 30 farmers from different parts of Lakhimpur district participated in the training programme. The programme was inaugurated by Dr U R Tamuli, Associate Dean, LCVSc. In his welcome address he emphasized the role of indigenous and backyard poultry farming for uplift of rural economy. He also encouraged the farmers to take up the enterprise in a large scale scientific manner. Resource persons of the programme included Dr S S Pathak, Dr Kanak Ch Barman, Dr Sanjib Khargharia and Dr Kandarpa Boruah. They discussed at length about poultry housing and management, poultry nutrition and feeding, economics and marketing, diseases and its prevention. Farmers were taken to the poultry farm maintained under Department of Livestock Farm Complex, LCVSc, AAU at Joyhing after the technical sessions to acquaint them with scientific rearing and management of poultry farm. A practical demonstration was carried out by Dr Karuna Saikia and Dr Pradip Rajbongshi. They interacted with the farmers and gave an overview related to daily routine works to be undertaken in the poultry farm to obtain maximum profit.